The weekend was a long-awaited and finally got to Mustang Maniac to get back to work. The plan of action was to finish as much as we could obviously. 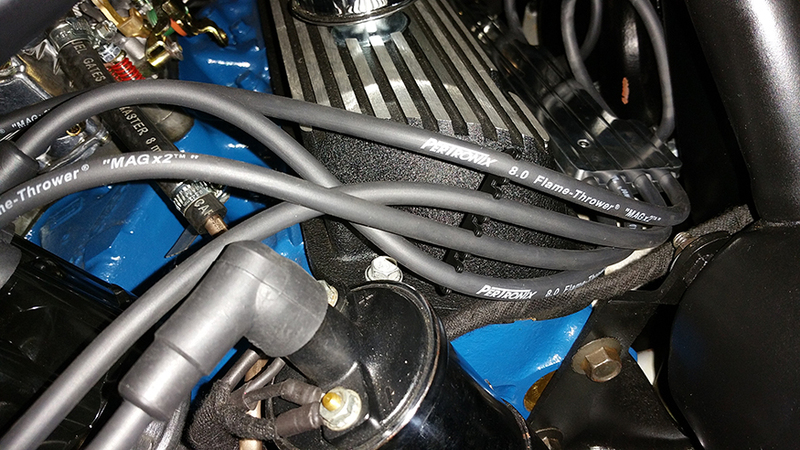 We started with the HT Leads (high tension leads) or Ignition Leads from the distributor cap to the spark plugs. My original leads were in blue and since then I have changed my mind. I now wanted black ones to match the colour scheme going on under the hood. The HT leads came in a pack and needed to be made to fit the car where I wanted the cables to be routed. 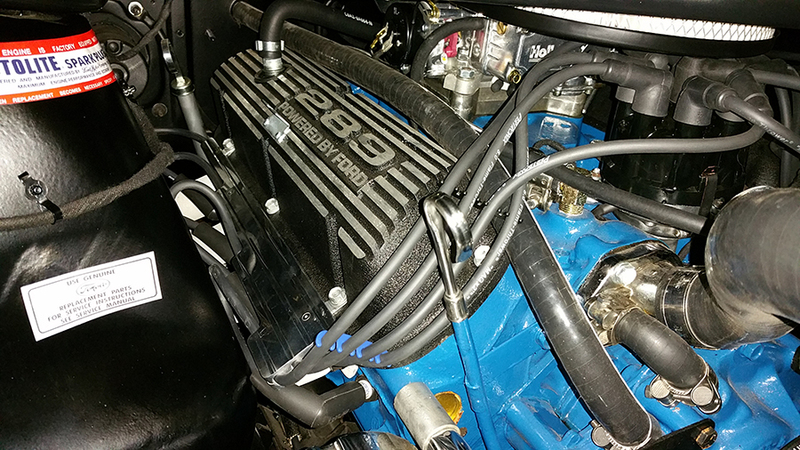 Instead of going across the top of the rocker covers where i have the “Powered by Ford” logo it would be partly covered up. So now I wanted them around the front of the covers instead. The leads have the spark plug connections already made and the distributor cap end has to be made to length. To do this properly there is a particular tool that will splice the cable to expose the centre core and then correctly crimp the cables to the fitting. These are the old wires I used to first start the engine up in the kit form. Adam advised me that he had a little bling if I wanted it, but it would also serve a very useful purpose. These are the HT lead routing blocks. In effect they hold the cables in place at the side of the engine block and keep the cables neat, the down side is that they just happen to be chrome though. Such a shame – Not! Anyway, firstly you need to place the leads on the spark plugs and work out where they are going to go and then mark the point where they need to be cut. Leave enough length to allow any loop or safety margin for error. Nothing worse than cutting to short, you can always go shorter. Once you have cut the leads then you need to slip the rubber boot cap over the wire. As these will be a tight fit a generous spray on the lead and the rubber boor will allow the wire to be pushed into the boot and the end pulled through with some long-nosed pliers to expose the connection. With the core showing bend the core under the cable to trap onto the fitting and then crimp up. With the crimp completed pull the boot over the fitting and plug into the correct distributor place or correct firing order. The HT block then screws into place on the rocker cover using the same bolts. Once in place pull through the loop of cable to make it look neat and how you wanted it. The end result is a great looking set of wires from the front, and the distributor cap is partly hidden by the air filter. But still my OCD wouldn’t allow the cable to be odd and still needed to be neat even though you can’t really see them. But, I know they are there and how they should be. From the top down it still had to look right. Next up was the fun bit, I wanted some original stickers back in place under the hood. There was no specific rule of thumb here and each production line and indeed operator would do it how they see fit. So on one car the sticker would in one place and on another it would be somewhere different. A good example of this was the left hand side shock tower, where some of the information sheets were upside down. This meant they read correctly when you look in the engine to service the engine from the fender side, but it was wrong trying to read it from the front. So I went for the right way up as nobody else will be servicing my car apart from Mustang Maniac guys or me. The stickers came in a pack and I placed them roughly where they should have been, but there is not right or wrong here. I have seen these stickers all over the place, but the couple I had there before the restoration were put back where they came from. 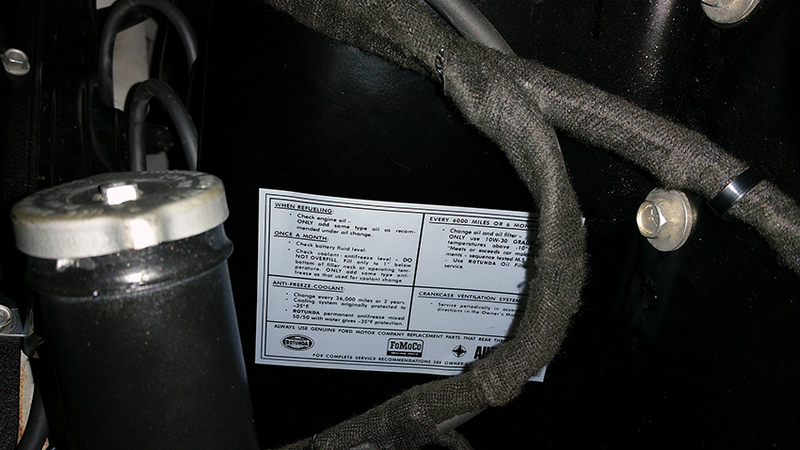 there were stickers for the air filter (which wasn’t relevent for my filter), oil filter, battery check, tyre pressures for the glove box etc. Amazing set of stickers that has made a difference. 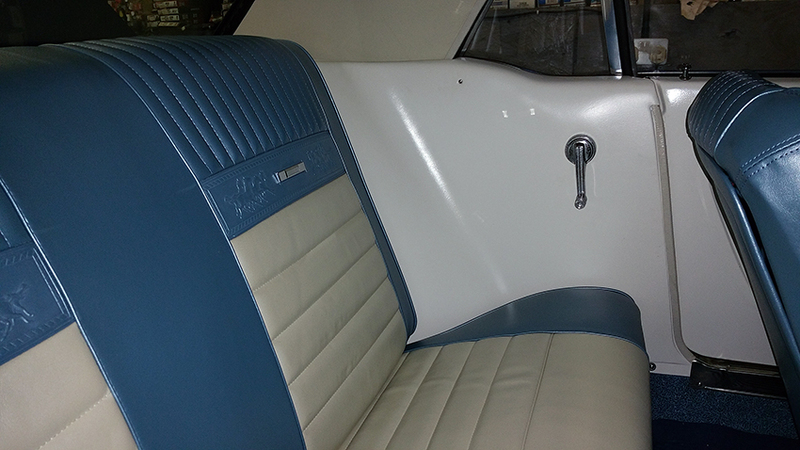 Once the little bit of fun was finished it was time to complete the dash trim. This had to be screwed into place and use an air powered Dremel type tool to get right into the corners. Can had to be taken not to damage the dash pad going in or coming out with the drill bit still spinning. 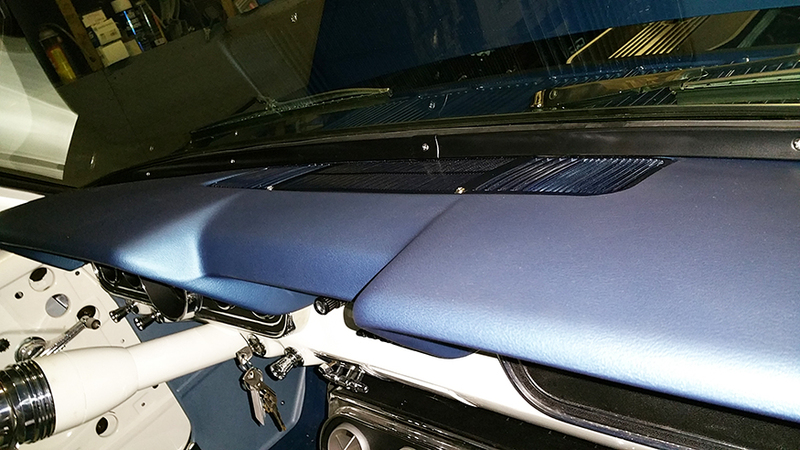 The black trim looks great and finished the dash area of nicely. Make sure you have a very good fitting screw driver for the screws. If you slip and run forward you will smash into the glass windscreen on the edge and a chance of cracking the glass. The rear of the car is completed now with the rear handles being fitted to the rear quarter glass winder mechanisms. It seems to finish it of quite nicely. The outside needed to have the sill mouldings fitted back on. These are held in place by a set of clips pop riveted into the sill. Yogi showed me how to do it and left me to complete the installation on the sill. The front fender would need to be drilled and fitted in place but we ran out of time. I will get some more pics when that part is done, for now you will have to look at the fairly ugly clips. Moving on to the trunk area now. There is a wire that runs from the loom across the trunk area and under the car to the fuel sender. This was usually held in place by a piece of tape and hidden by the fuel tank. I went a little different and used “P” clips under the securing bolts to hold the cable in place. I have been thinking about this quite a bit. I have a fantastic polished stainless steel fuel tank that seems a shame to get covered up. So I am thinking about cutting the centre out of the plaid matting and expose the fuel tank just for any shows. when I say gut it out I will only expose the centre part of the fuel tank and cover the nuts and bolts to keep it looking nice and neat. That way the cut out section can then be replaced back onto the fuel tank when not on show or I need to carry things about again. The matting was brought down from the stores by Adam and we laid it out hoping the creases will drop out soon just like the carpet did. I will bring that update on the blog as soon as I have decided. Any thoughts out there on whether I should keep it covered or expose just the centre a little? 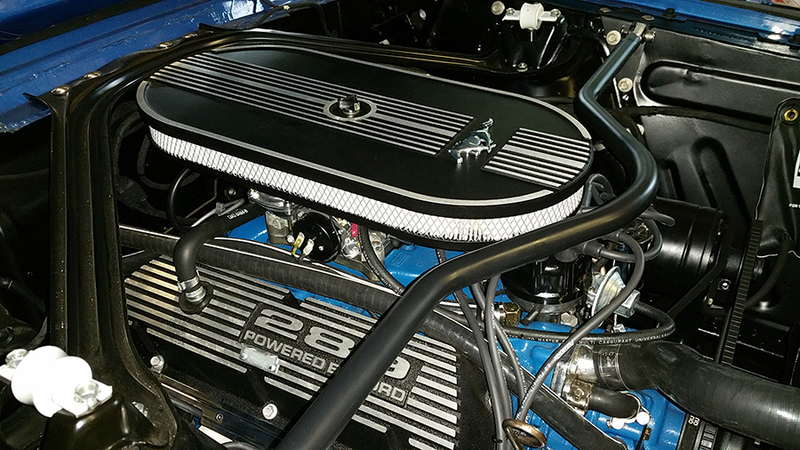 This entry was posted in Car, Photo's and tagged Dash pad, HT leads, ignition leads, Mustang, Mustang Maniac, One man and his Mustang, pop rivet, sill mouldings, Stainless Steel fuel tank, stickers. Bookmark the permalink.